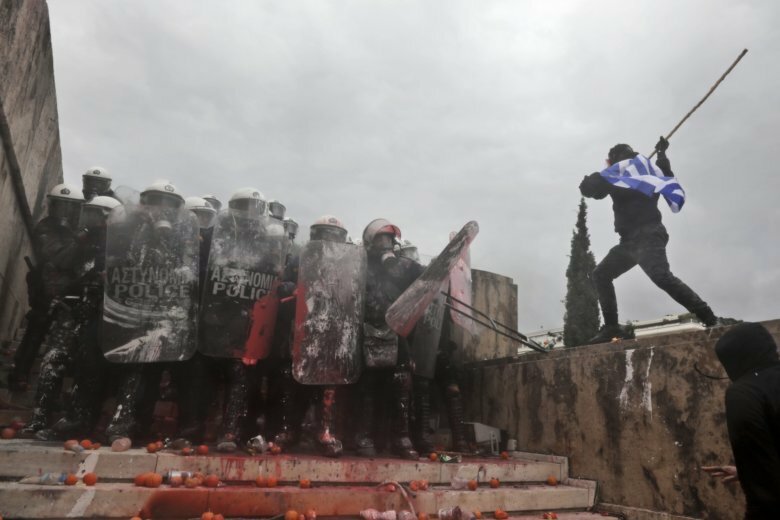 ATHENS, Greece (AP) — Protesters clashed with police outside Greece’s parliament during a rally that drew tens of thousands of people Sunday against the Greek-Macedonia name deal. At least 25 police officers were injured and seven people arrested, police said. Greece’s parliament is expected to start a debate Monday on ratifying the deal and vote on it by Friday. Macedonia’s parliament has already approved it, agreeing that the country would go by the name North Macedonia. Macedonia and Greece struck the deal in June to end a decades-long dispute over Macedonia’s name, which Greece says harbors territorial claims on its northern province of the same name. Protesters are against the deal because they believe that any use of the name Macedonia in the neighboring country’s name is a usurpation of ancient Greek heritage and implies territorial claims on Greece. A statement from Prime Minister Alexis Tsipras’ office blamed “extremist elements and members of Golden Dawn” – an extreme-right, anti-immigrant party – for the clashes on Sunday. “In our democracy, citizens’ free expression is an inalienable right, even for those who want to abolish democracy … It is also the duty and obligation of those of us who do believe not to allow them. Let’s isolate and condemn them,” the statement said. Among the people who addressed the protest were former conservative Prime Minister Antonis Samaras, a member of the Mount Athos monastic community and a Greek-American former politician, Chris Spirou, once a member of New Hampshire’s House of Representatives. Costas Kantouris contributed reporting from Thessaloniki.